Bosch geothermal heat pumps are both energy efficient and eco-friendly. Homeowners in the U.S. average $1,900 a year on utility bills, with over 20% going to heating and cooling costs. So it only makes sense to have the most energy efficient HVAC system for your home, such as Bosch Energy Star certified geothermal heat pumps. Geothermal heat pumps, also known as ground source heat pumps, are endorsed by both the Dept. of Energy and the EPA as among the most energy efficient and eco-friendly ways to heat and cool your home. Geothermal systems are 50% to 70% more efficient for heating and 20% to 40% more efficient for cooling than traditional furnaces and air conditioners. Unlike systems that burn fossil fuels – such as gas, fuel oil, coal, or wood – geothermal heat pumps do not produce carbon dioxide greenhouse gas emissions. About one million geothermal heating/cooling systems have been installed in the U.S. since 1980, reducing the output of carbon dioxide released in the air the equivalent of taking 650 million cars off the road. While a standard heat pump uses the temperature of outside air for heating and cooling, a geothermal heat pump draws on the more constant temperatures found underground as the medium of exchange. Through a series of buried pipes, a geothermal heat pump absorbs heat from the ground in the winter to warm your home. In the summer the process is reversed, with heat removed from your home and transferred back into the ground. Buried pipes for horizontal, closed loop, geothermal heat pump. The network of buried polyethylene pipes used to exchange heat operate as either a closed or open loop. In a closed loop system, a mixture of antifreeze and water is circulated from the heat pump through the pipes and back again. An open loop, on the other hand, draws water from a well or pond, which is then returned to the ground after use. Pipes for a closed loop geothermal system can either be buried horizontally 4’- 7’ deep or vertically 150’- 400’ underground. Once the heat has been extracted from the fluid, it’s transferred to an air handler and ductwork to your home similar to other forced air HVAC systems. A geothermal heat pump is also a very efficient way to heat water for your home, since waste heat from the compressor can be used to produce hot water at very little expense. Geothermal heat pumps last 25 years on average while underground pipe loops can operate for over 50 years. Over the life of the system, geothermal heat pumps cost 25% to 50% less than a traditional system, and the added installation expense can be recouped in as little as five to seven years. Find out how much you can save on your home’s heating and cooling with the Bosch Geothermal Savings Calculator. 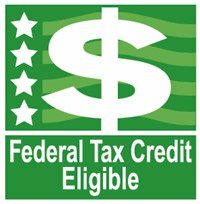 Geothermal systems are also eligible for a federal energy efficiency tax credit of up to 30% of the cost of installing the system. Both principal residences and second homes are eligible for the federal tax credit. Geothermal heat pumps may also qualify for additional state and local tax incentives or rebates. More information is available at Bosch Thermotechnology.